Last November I wrote a Post that included a poem from the Captain of the Thistle Golf Club, David Jackson. 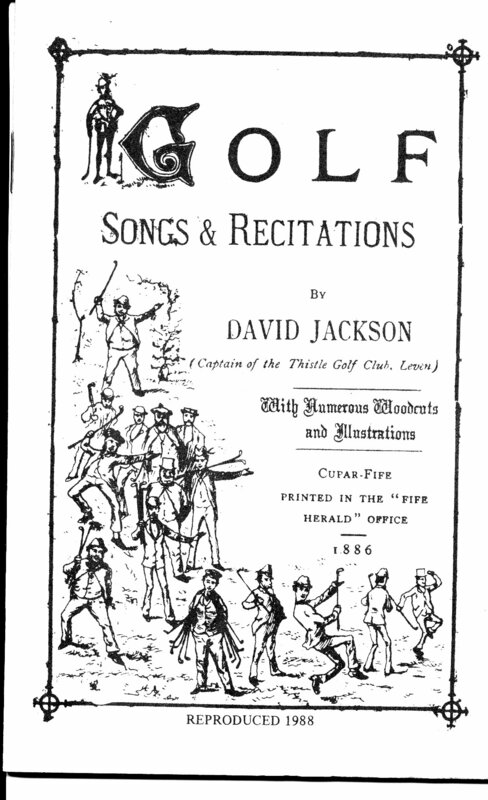 The poem came from a 32 page book called Golf Songs & Recitations published in 1886. In my November Post I said that the book was not available in any library. I have since learned that one copy exists in the library of the University of British Columbia. I managed to find a 1988 reproduction of the book. I picked up Jackson’s book again recently and found a relatively short epic poem called “The Breaking O’ the Clubs.” The poem describes the tensions that golf created between a man and his wife in the 1880’s when golf was becoming more popular among the rank and file. In writing the poem, Jackson used some Scottish dialect which I have tried to translate using Internet sources. The poem is interesting both for its lively content and its “happy” ending. Wi’ (with) joke and sang, it wisna lang till it was time for shutting. Then hame I goes on my tiptoes, but ah! the wife was waken. For a’ this lung and words high-strung she surely will be sorry. When horrors, a’! what was I saw – my Clubs and Cleeks a’ broken. It’s quite enough to drive me mad, and raise a perfit scandal. The neebors gathered round the door, and some glowered through the window. My heart wi’ grief and anger torn, my brain wi’ rage near turning. I coudna sing a lilt, or say a word to my next neebor. Wha’s (Whose) was the first that met my sicht—my ain (own) and she was smiling. The wale (choice) o’ wud, a powerfu’ shaft, and bonnie driving head, man. And ever since ye coudna ha’e a better wife than mine. Though somewhat over the top, this story is probably representative of male golfers’ attitudes in the 1880’s.